AN OVERVIEW OF THE ESSENTIALS FOR CHRISTIAN FAITH AND LIFE. How were the books of the Bible chosen? What was the Roman world like during Jesus’ life and ministry? How are we to live out our faith in today’s world? Living Faith enables believers of all backgrounds to understand Christianity more fully through an exploration of its history, foundations, and core beliefs of the faith. This informative, insightful, and practical book compares and contrasts Christianity with other world religions, proposes helpful disciplines for a believer’s spiritual growth, and provides a clear and balanced look at controversial topics such as the Apocrypha, free will, and end-times theology. Perfect for either personal or group use, Living Faith is an ideal and accessible resource. Living Faith: A Guide to the Christian Life, © 1999, 2005 by John Schwarz, published by Baker Books, Grand Rapids Michigan. Living Faith is an abridged version of A Handbook of the Christian Faith (Bethany House Publishers, 2004). 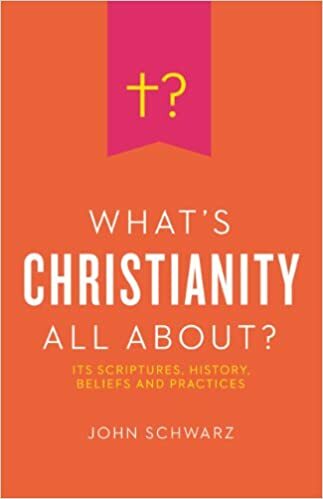 John Schwarz has recently (2015) published What’s Christianity All About? : Its Scriptures, History, Beliefs, and Practices, an updated version of A Handbook of the Christian Faith (which was the longest of all the revisions). Living Faith, accessible at the links below with the author’s permission, contains approximately 25% of the content of What’s Christianity All About? The best way to do this study is to obtain the more thorough What’s Christianity All About? (or, The Handbook of the Christian Faith).